Page 247. According to a Swedish Study by Anders Halgren of 400 dogs of owners who agreed to have their dogs' spines X rayed - 63% had spinal injuries. Of the injured dogs with neck (cervical) injuries, 91% had experienced harsh jerks on the leash or were serious leash strainers. Among aggressive or overactive dogs, 78% had spinal injuries. Patricia McConnell's "Family Friendly Dog Training" talks about structural damage due to leash yanks. From Karen Pryor's Reaching the Animal Mind: "..Those jerks can easily damage the trachea. Many elderly pet dogs wheeze and cough not just because they are old but because their windpipes are collapsing from years of being diligently yanked on a leash." From an article on "Raising Canine"
Sherry Fries, an accredited animal chiropractor, states "Anybody who still employs the jerk method for training their dogs ... should have the same thing done to him or her," she says. What happens? "Whiplash of the most severe kind. It can also set the stage for disc disease, neuropathy, or disease to the spinal cord and nervous system." According to British veterinarian Robin Walker, the "yank and stomp" method was popularized...... "Since then I have seen a stream of screaming dogs arriving at my surgery with dislocated neck bones and damaged voice boxes." As i mentioned in another post, some people use the very painful method of placing a choke chain or slip leash high behind the ears and use the excuse that is protecting the dog's trachea. According to this picture, the trachea starts not far from the nose so anywhere you put a choke chain or slip leash could cause trachea damage. "Check chains may have been the preferred training tool 30/40 years ago but we didn't know much, if anything, about operant conditioning then. We know better now. ... It focuses on very damaging aspects of the training equation (punishment or negative reinforcement), and the part that does the most damage. ...As a training tool the check chain is crude, outdated and unnecessary." According to this blog post by trainer, Emily Larlham, tightness around the neck can cause hypothyroidism, ear damage, eye damage, limb nerve damage, etc..
"The features of severe ischemic brain damage after strangulation by the owner of a 1-year-old German shepherd dog are described. The dog was disciplined by the owner during training by holding the dog off the ground by his choke chain collar. At first, the dog behaved normally, but he became increasingly ataxic and started circling to the left and showed reduced consciousness. The neurological examination revealed severe disorientation, left lateral pleurothotonus, and circling. The neurological findings were consistent with a multifocal brain lesion..."
"Trauma for an animal may result from an accident, repetitive jerks on a leash (especially one attached to a choke chain)..."
"[Name of]devices say it all-choke chains, pinch collars, and electronic shock collars-they are designed to punish and cause pain and have no place in modern, stress-free training." "...equipment such as choke chains, pinch collars, and electronic shock collars can cause undue stress and anxiety and may lead to fear and aggression." "Corrections of this sort could easily frighten a fearful dog. Fallout can be created as well, in the form of unwanted associations. Because dogs associate things that happen within seconds of each other, if a dog is corrected just as he is looking at (or lunging at) something that frightens him-for example,another dog-he could easily associate the other dog with the correction. Now the poor dog is thinking, I just knew other dogs were trouble! If this unfortunate timing continues, the dog could develop progressively stronger reactions..."
"...they are also at risk for laryngeal damage, esophageal damage, and ocular damage..."
Pet parents who choose to use choke chains - only use them when attached to a leash during a walk. Never leave a choke chain on a dog as a regular collar. The dangers are numerous. 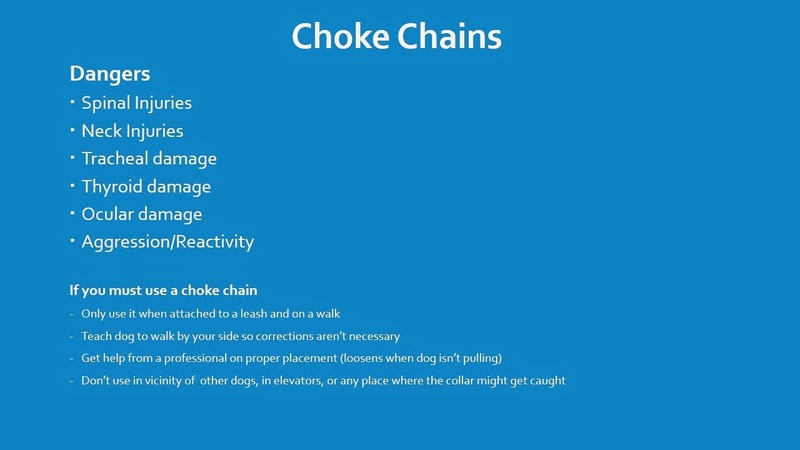 Also never ever tether a dog with a choke chain. Do you need an alternative to choke chains? Tell us about it in the comments section below. Great post. I have shared it on my Upward Dog Training & Counseling page.